Successfully Added iPod and USB DJ Mixing Deck to your Shopping Cart. Turn up the beat with this combo iPod & USB DJ mixing Deck. Introducing the ultimate iPod gadget that is specifically designed from the ground up to perform to the highest standard! Perform and mix all the music in your iPod library with this combo iPod & USB DJ Mixing Station. 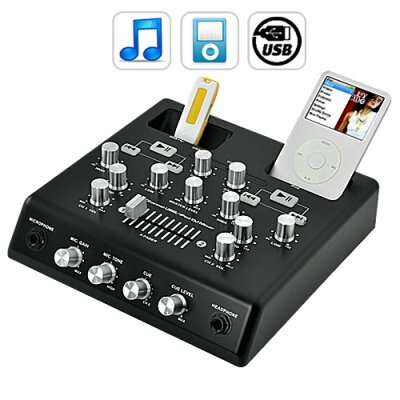 This iPod and USB mixing deck is compact and easy to use. Just drop in your iPod and USB drive that is loaded with MP3 or WAV music files. Then, attach its RCA master output to a stereo or a speaker system and you're ready to DJ! This iPod DJ Mixing Deck comes with gain control on each channel as well as microphone tone, MID fader, low fader, cue MIX, cue gain, and high fader level controls to enable you to optimize each channel's sound for optimum performance. In addition, this iPod DJ Mixing deck also charges your iPod at the same time while playing the music from your iPod music library. This iPod DJ Mixing Deck is brought to you by Chinavasion at a wholesale price. This cool iPod gadget is ideal for reselling on your eBay listing page or drop ship web shop. Click "Add to Cart" now, and chinavasion will express ship you a sample straight away. For wholesale electronic gadgets for your iPod, look no further than Chinavasion.